You’re always getting asked by your clients for recommendations to quality providers of aligned services, whether that be web design, digital marketing, SEO, TV ad production or any range of things. But it can be difficult on the Gold Coast to find quality providers of services. Someone you can trust. 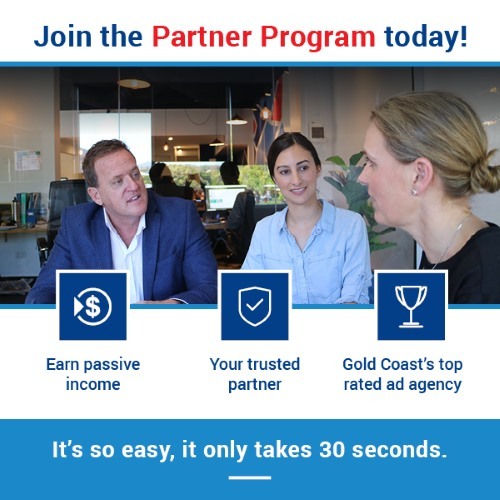 With a solid 20 year history as a full-service advertising agency on the Gold Coast, specialising in online work, we are here to help you bridge that gap – at the same time providing you with some passive income. We’ve started our very own Partner Program. It’s where we partner with firms just like yours, to help your clients with the services that you don’t offer. We’re the team you can refer to knowing your clients will be in safe hands. It’s a simple program – refer any of your clients over and we’ll provide a 10% commission on their initial contract within 7 days of receiving a down payment from the client. Of course, if you’d like to catch up for a chat or come on in and meet some of the team, we’d be delighted. If you have any questions please email us direct at partners@tailoredmedia.com.au or call on 07 5534 1228. Founded on the Gold Coast by Brendon Sinclair, Tailored Media has been a long time leader in web development, digital and offline advertising and publicity. We pride ourselves on our people. With in-house specialists across a range of areas, you get the right work from designers, web developers, publicists, digital marketers, copywriters and more. Accredited Google Partners, rated the Gold Coast’s best ad agency, getting real results and committed to success. With 20 years of success, we know just how to give clients awesome value.